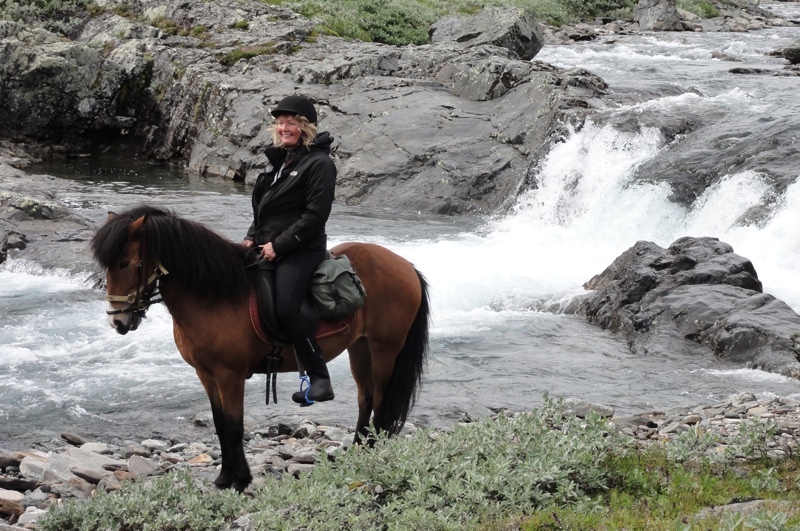 To choose a longer tour with Icelandic horse in the mountains is a perfect way to see the mountains. 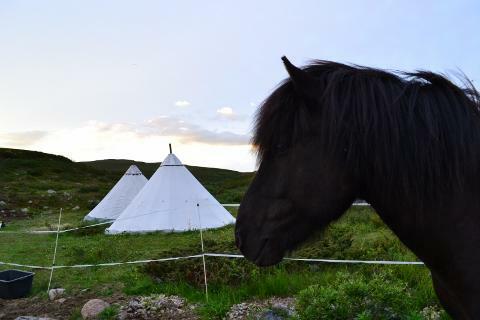 You get to know the Icelandic horse, have an adventure, be out in the nature, sit round a campfire, learn about the Sami culture and sleep in a Sami tent (lávvu). The main things will be the horse, riding, nature, weather and food, a long way away from stress. This tour is for you who want to ride up in the mountains with great views, near the nature in an area where very few people are. Mostly we ride in pathless terrain or on paths and we adjust the tempo after the terrain. This is also for you who do not mind helping out with camping chores and not mind to be without luxury to experience the natural way of being out in the nature. For this tour you need riding experience. When you arrive to Kiruna we pick you up and then we go by car to our horse farm. We eat dinner together and you stay the night in a house at our farm in double rooms. The first day we start in the morning from a place close to our farm where we go by car and ride through the forest up on the bare mountains with a fantastic view. You get a horse which suits you. We ride on the south side of the Kalix river. This night we sleep in a Sami tepee (lávvu) where we sleep in sleeping bags round the fireplace. In the tepee we can make a fire if we want to. The two following nights we sleep in a cabin. During the tour we have an extra horse carrying the food and other things, but everyone carries her/ his own personal things in saddle-bags on the own horse. The next morning we pack our things and ride over the bare mountain and come then down to the small sami settlement Ratekjokk where we stay for two nights. In Ratekjokk we can have a sauna in the evening. The fourth day we ride a day tour and come back to Ratekjokk. For the next two days we ride over the mountain with a night in the tepee and come back to the place we started from and then to Puoltsa where we stay overnight on our horse farm the last night. Then it will be nice to get a shower and after that we have our last dinner together. We bring you back to Kiruna the seventh day after breakfast or later on. Some of the departures can be a bit different, then we start or end the tour in Ratekjokk, but you have the same amount of nights in teepee and house in Ratekjokk. For this tour that is good if you have riding experience, are able to control a horse in open terrain and are in good physical health. It is also good if you have been camping before. We ride 15-25 km each day. During the tour we will stay overnight in a Sami teepee (lávvu) and in a cabin. The places where we stay overnight are quite simple, but nice. When we stay overnight in the house on our farm there are double rooms with shared kitchen and bathroom. 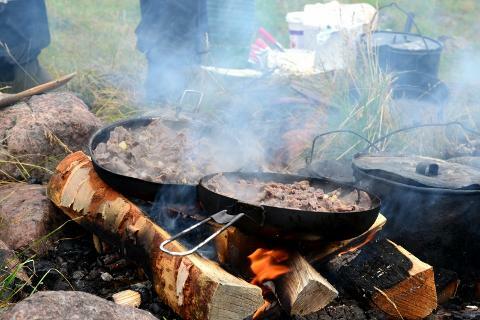 The food we cook together over a fire when we are outdoors (or in the tepee in bad weather). The food is exclusive specialities from this area, for example reindeer meat and fish. On the tour we help each other with the horses and with camp chores. Sometimes we need to lead the horses when the terrain demands it. Because we are riding in a mountain area we have sometimes to change the route because of the weather. 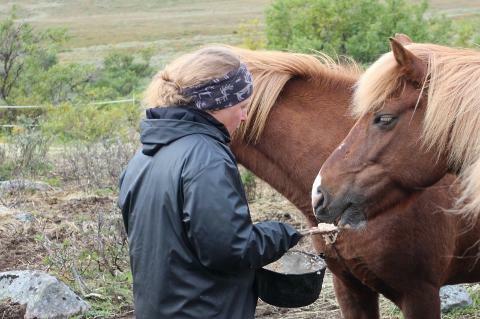 The Icelandic horse is a strong horse but not very big so the rider ́s max weight is 90 kg. We lend you a riding helmet. Minimum age is 12 years. Minimum number of persons is 2 and maximum number of persons is 10. This tour is quality-labeled with Nature´s Best by the Swedish Ecotourism Society. 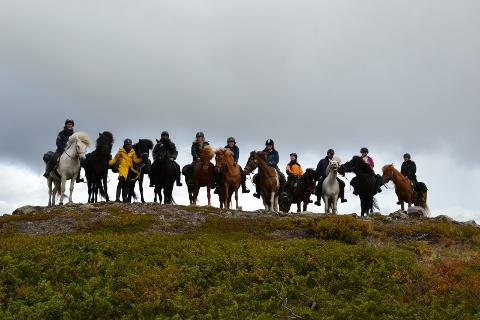 Included: Full board and lodging (dinner 1th day-breakfast 7th day), guide, horse with equipment, helmet and transfer from Kiruna C.
Restrictions: You need to be minimum 3 persons for the tour to run. Please note that other guests can be booked on the same tour. Please note! If the tour seems to be full, don't hestitate to contact us so we can doublecheck the possibilities for you to participate.